BLW: Let’s welcome the successful Indian author Debasish Mishra to Book Lovers World. Debasish Mishra: Thanks. It is purely my pleasure. Debasish Mishra: I am a resident of Bhawanipatna, a small town in Odisha. I was an Officer in United Bank of India for four years – from 2011 to 2015. However, owing to the tiring toil which resulted in my dwindling time for literature, I resigned from my job. I am quite happy now. Apart from a host of publications, I received the Poesis award of excellence for literature last year. I wish to complete my maiden novel shortly. BLW: Tell us about your short story FRIENDS FOR LIFE, what it means to you, and how did you feel when you saw your name in the winners list? Debasish Mishra: FRIENDS FOR LIFE revolves around two friends, Jatin and Shubham, who share the same room in a hostel. This story is really special for me. After all, I recollected my own memories of hostel-life and blended them with my imagination to frame the plot. It was indeed a great delight to see my name in the winners list mainly because of my strong liking for Shades publications which has rendered space to my ink in all its anthologies till now. Debasish Mishra: Jatin and Shubham are the two protagonists of the story. Jatin belongs to the affluent class while Shubham hails from a lower middle class family. In fact, their bond grows amid aplenty differences. To quote my words from the story, “Company by choice and company by chance are two different things. The former is a product of the human heart while the latter emanates from the wombs of Fate. Human heart can err. It can deceive. But Fate comes with unmistakable inevitability.” The characters are a piece of imagination for sure. Nevertheless, I have brushed them with the strokes of realism. Debasish Mishra: Friendship as a theme has always amused and amazed me. I wanted to convey a simple plot where ego takes the upper hand and plays foul, until it is dismantled by the strength of friendship. I wanted to write a tale for my friends. To be candid, some golden moments of friendship which I always cherish inspired me to pen this story. Debasish Mishra: I will definitely dedicate this story to all my friends. I have seen many places, made many friends, and gleaned numberless moments of glee. This story is for all those wonderful people who occupy a large chunk of my heart. Debasish Mishra: Initially, I had this urge to write for every contest which I came across. Luckily, I have never sent my work to paid anthologies. Commerce overpowers art these days. The younger lot is easily swayed by the temptation of getting published. However, it is really of no use in the long run to boast of myriad substandard publications. I am quite happy to share that my choices have bore fruits. Anthologies like DIVIDED LINES – A POET’S STANCE(published from USA where I am the only one representing my country), MELANGE(published by Authorspress for Poet’s corner which includes stalwarts like Ruskin Bond, Vikram Seth, Jeet Thayil and Shekhar Kapoor among others) and THE STORY WAGON(an international collection which contains my prize winning story “The inner side of innocence”) provide real happiness. Debasish Mishra: I have a blog (devilsdiary.yolasite.com) and a page(www.facebook.com/debasish.devil) in facebook with the name DEVIL’s DIARY. I only share my poems there. In my view, a blog extends the reach of a writer. 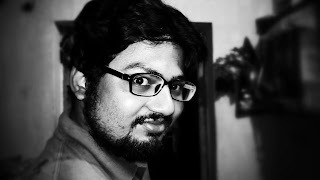 Debasish Mishra: For me, writing occurs spontaneously. I may write at any time – during a train journey, in between drafts of sleep, anywhere and everywhere to be specific. I have this insanity for creativity. No. There are no lucky props in my case. It’s me and my heart and the things I observe…! Debasish Mishra: I always wanted to be a writer. I wrote my first poem when I was in class four. There is nothing else that mesmerized me so strongly. Debasish Mishra: My family is a great source of inspiration. My parents support my decisions no matter how absurd they seem. My brother backs my creativity. My sister is my best critic. She has the first rights to my work. I sincerely value her feedback. Apart from them, my friends inspire immensely. It would be unfair to point out who they are.. But they know themselves ! Debasish Mishra: THE GUIDE by RK Narayan has left an indelible mark in my psyche. I have read it again and again. The simplicity of expression armed with the genial humour of Narayan is rare to find now-a-days. THE SUBMERGED VALLEY AND OTHER STORIES by Manoj Das is another gem that has influenced me. Debasish Mishra: I love to write lyrics and compose tunes for them. Very few persons know of this. Debasish Mishra: It is really unfair to pick five books… There are so many good books that I have come across. Nevertheless, the best five that strike my mind at his hour are THE GUIDE(RK Narayan), THE SUBMERGED VALLEY AND OTHER STORIES(Manoj Das), AN ASTROLOGER’S DAY AND OTHER STORIES(RK Narayan), A TALE OF TWO CITIES(Charles Dickens) and KING LEAR(William Shakespheare). Apart from these, my reading world holds an eclectic mix of various writers – old and contemporary. Stories by Rabindranath Tagore, Ruskin Bond and Anton Chekhov deserve a special mention. Debasish Mishra: I will urge our readers to read good books. By good books, I mean richness of content and clarity of expression. The readers determine the fate of a book. A good book may die in oblivion. A substandard one may rule the bestseller charts. In fact, it’s more like a reality show where the audience decides the fate of a contestant. Hence, before paying your hard-earned money for a book, ponder if it’s actually worth it. 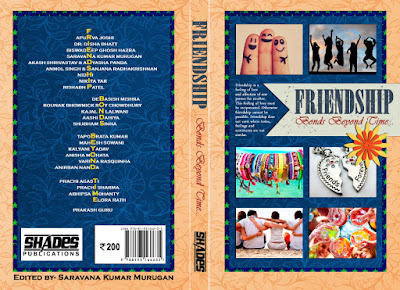 And if you want to know the nuances of a good book, do get a copy of FRIENDSHIP – BONDS BEYOND TIME. Thank you so much for your time, Debasish. It’s our pleasure to chat with you… And to the readers stay back for more. For the first time in BLW, we’re interviewing all the contributing authors of the book. We hope you will like reading the response. Stay Tuned!